Supplementary material reads: "Date: 1956-07-16. 25-26-27-28. Assignment: Gentle-Guide Dog suit. Photog: Wyman. Reporter: McMahon. 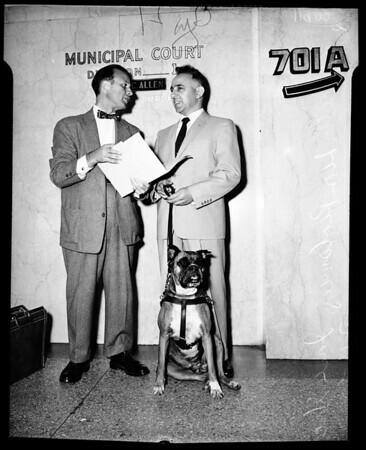 Atty Leon Perlsweig & Jack Gentle (blind) with guide dog "Tanya". Atty has (bowtie [sic])".